Why include AirPlus in your RFP process? At AirPlus, we’ve spent over 25 years developing payment and expense management solutions tailored for business travel. This means that unlike other providers, we focus on this sector and our products are designed specifically for it. Setting up a travel programme or a payment solution can be complicated, and one size doesn’t fit all. At AirPlus, we will look at how your current travel payment and expense management works, so that we can offer our expertise on what the best solution is for your business. AirPlus are one of the few providers that can provide a complete solution, in addition to this the quality of data provided by AirPlus that can feed seamlessly into your existing set-up is second to none. Our awards back up our claims that we are the experts when it comes to business travel payments. 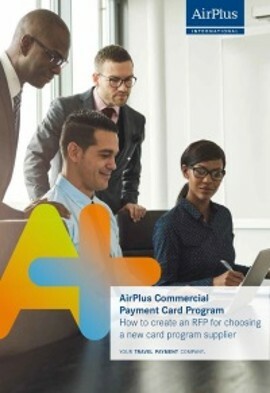 At AirPlus we participate in many corporate card and payment programme requests for proposals (RFPs) every year. There is one common lesson we learn from all of them: companies which get the RFP process right end up with the best service for their business. Those which issue a poorly conceived RFP often go on to have major problems with their card supplier contract. At the center of the RFP process is the RFP document itself. A well-structured tender document acts as a clear roadmap, not only for the supplier selection but also for implementation of a successful contract once the vendor is chosen. A good RFP helps you, the customer to better understand exactly what you have today and what you want your chosen supplier to achieve for you. We know that finding the right formula is not as easy in practice as in theory. That is why, based on our long experience of seeing both the good and the bad in RFPs, we have produced a white paper to guide you through the process of choosing a new corporate card provider. A three-step guide to giving the right information and asking the right questions. A template you can use for your next card RFP. An appendix showing typical requirements of internal stakeholders.